It’s been another eventful week in Greece, where it seemed we had agreement, followed by a tense weekend, followed by a real agreement on Monday morning. Now we wait for first Greece, and then another six countries to ratify the deal. So once again we’ll be swerving around Grexit, and instead we’ll mostly be covering the reaction to last week’s Summer Budget. Today’s Weekly Roundup begins in the FT, with the Chart That Tells a Story. 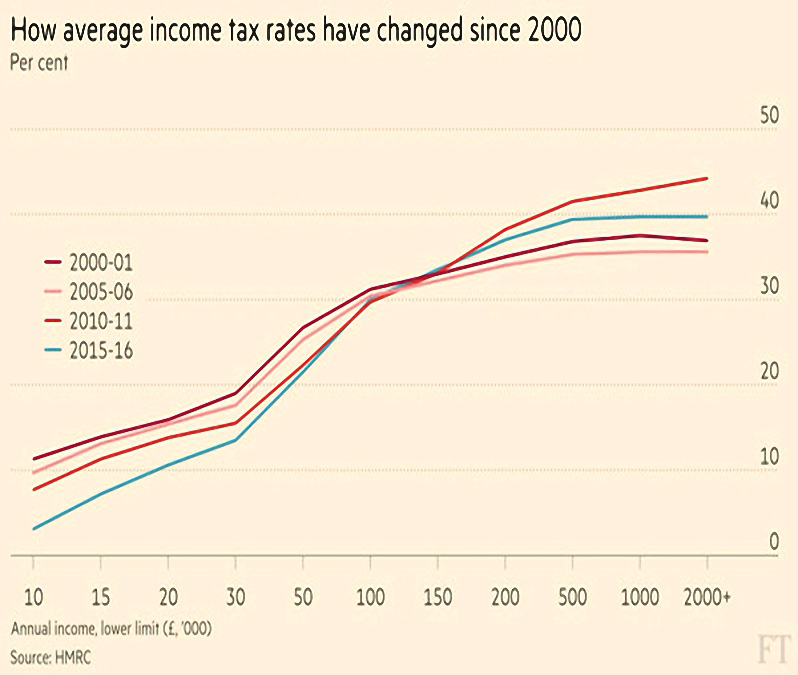 Adam Palin looked at average income tax rates over the past 15 years. The overall average has barely changed (down from 17.7% to 17.2%) but the distribution across income levels has become more progressive (with higher rates for higher earners). Those on the lowest salaries (< £15K) have seen the biggest reduction in tax (from 11.3% to 3.1%), as the personal allowance has been significantly increased. Those on the highest salaries (> £150K) have seen the biggest rises, with the introduction of the 50% rate (now 45%) and the tapering of the personal allowance above £100K. “Middle” income earners (£30K to £50K, so actually reasonably high earners) have done reasonably well, with average rates falling from 19% to 13.5%. The 40% tax threshold has increased from £32.8K in 2000-01 to £43.4K today. These progressive changes on income tax are somewhat undermined by regressive changes such as the increase in NICs from 10% to 12%, and the increase in VAT from 17.5% to 20%. Merryn thinks that primary homes shouldn’t be exempt from CGT. I think that if I had to pay tax on the gains on my house, I would never sell it, as I wouldn’t be able to afford a replacement. Removing the CGT exemption would lock up the high end of the property market even more than the recent stamp duty increases have. Merryn thinks that we pay very low council tax. I think that more than £2K per year on a simple terraced house is plenty, thank you very much. Merryn doesn’t like the tax breaks on buy-to-let, which were mostly removed in the Budget. I think we have a problem with buy-to-let in this country, but it’s an awkward solution to restrict tax relief on interest for a single group of entrepreneurs. It would be better to move towards a general solution that ends the favouring of debt over equity in business generally. Merryn doesn’t like the inheritance tax exemption for houses up to £1M. I think it’s a pity that houses were singled out, but the inheritance tax limits are too low. A couple in London could easily need £4M to buy a house and two pensions, and for them to be taxed on any assets over £650K is unreasonable. Tapering the relief away again on houses over £2M is also unreasonable, as is restricting the relief to children and grandchildren. The money used to generate the estate being taxed has itself already been taxed once, and that should be enough. The property problem in the UK is mostly down to supply and demand. We seem happy to squeeze ever more people on to our island, but unwilling to build houses for them. We need to create low-planning zones (“pink tape” zones, the Centre for Policy Studies called them) where more houses can be built easily. These need to be near London (where the population growth and wealth generation is) and have good transport links to the capital. 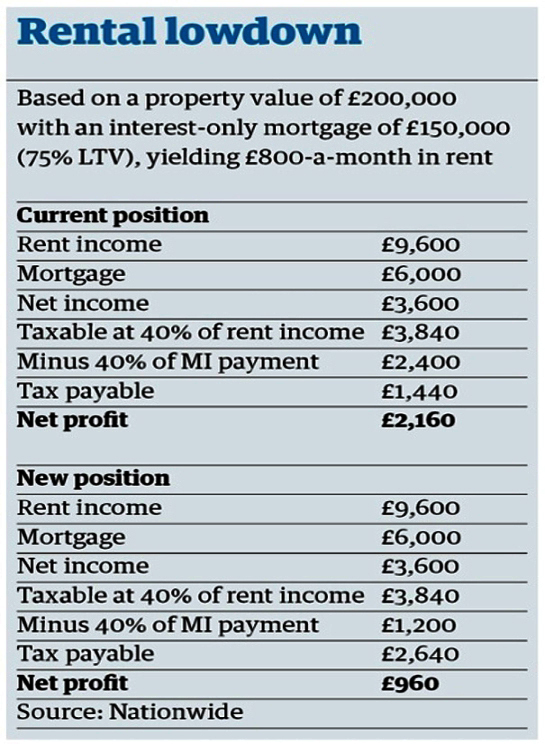 The planned reduction in mortgage interest tax relief from 40% to 20% will more than halve the typical profits on a rental property. 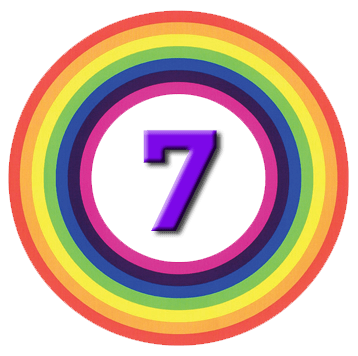 Even allowing for 75% gearing – which makes buy-to-let investors vulnerable should any property price crash ever occur in the UK – gross yields on the underlying £50K of equity in a £200K property are typically 19%, and net yields (after mortgage interest) are 7.2%. The changes would reduce after-tax yields for a 40% taxpayer from 4.3% today down to 1.9%. As ever, the attraction of buy-to-let escapes me: it’s a lot of work for a modest return, and I already have more than enough exposure to a UK residential property market which stands at record highs. 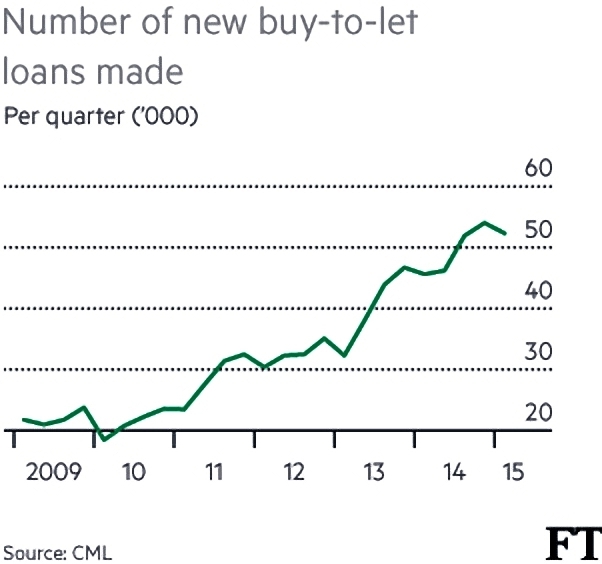 Buy to let was a good investment 15-20 years ago, but the easy money has been made. will landlords be able to pass on the tax as rent increases? 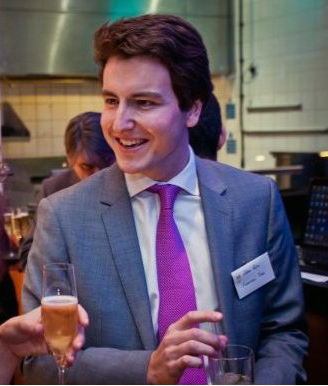 will private landlords be displaced by institutional investors? or will private landlords themselves incorporate to dodge the tax changes? Back in the FT, Ken Fisher was reassuring about UK debt levels. 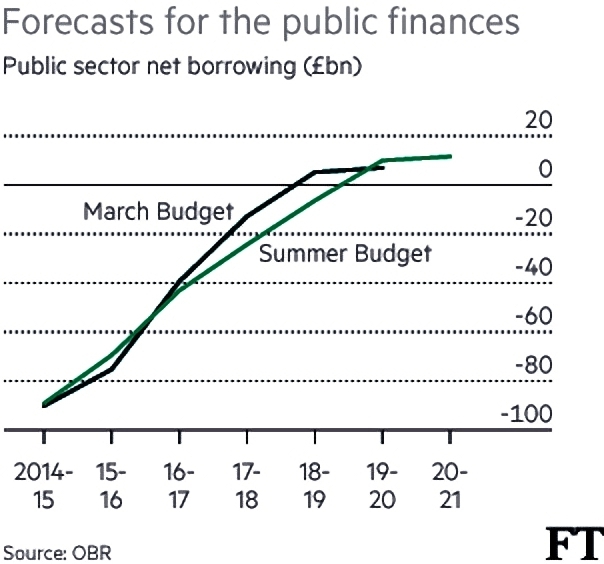 Ken thinks that the UK doesn’t need a budget surplus. Debt has tripled since 2007, from £500M to £1.5trn; relative to GDP it’s up from 38% to 81%. But the debt remains affordable: interest is 9.5% of tax revenue, less than in the 1980s and 1990s (when it was more than 15%). The government can keep extending average maturities of gilts (up from 14 years in 2007 to 17 years now) to take advantage of historically low rates. Ken points out that stock returns in the US have been better after peak deficits than after peak surpluses. 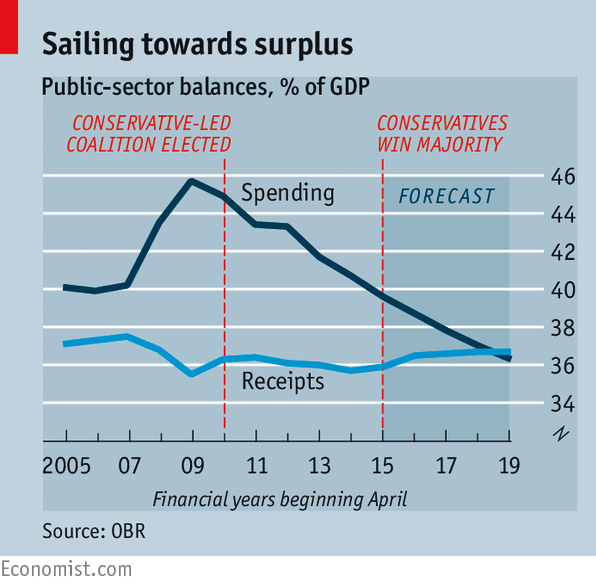 Surpluses also mean there is less money flowing around, creating a headwind against growth. 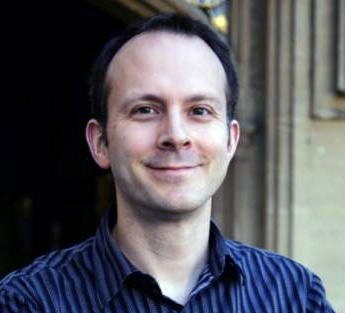 Tim Harford looked at wishful thinking in the context of public policy nudges. 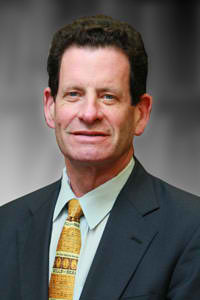 He began with the University of Vermont, which replaced bottled water with re-usable bottles and water fountains. Instead of switching to tap water, students drank more sodas. Tim says that when saving the planet, people focus on what they can see. Concrete has a much bigger environmental impact than bottled water, but there’s not much that the individual can do about it. That doesn’t mean that it wouldn’t be a good target for public policy action. The other problem is that the University had two conflicting goals: less landfill and healthier students. The wishful thinking that everyone would switch to tap water made them seem compatible. Nuclear power is a similar issue – we want to avoid greenhouse gases, but also avoid radioactive waste and nuclear power station disasters. That doesn’t mean that wind turbines are the answer. Closer to home, fracking in the UK – not to mention the expansion of Heathrow – are heading in the same direction. Tim prefers market signals such as a carbon tax to these careless nudges. The problem is that the kinds of people who are concerned about climate change and the environment (left wingers) don’t believe in market responses. The people who like market responses (right wingers) don’t care too much about climate change or the environment. 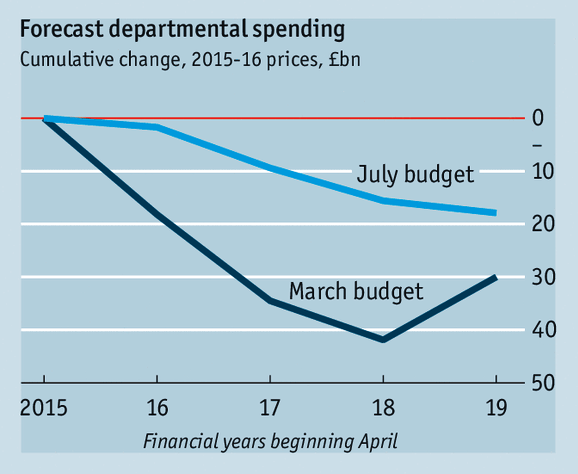 The Economist wasn’t too impressed with the Budget. They liked the way that Osborne re-branded the Tories as the party of the working poor. I’m with them on the last point – I’d like to see more infrastructure investment as well – but I like the first two policies. We’ve already discussed inheritance tax when we looked at Merryn’s FT column, so I’ll focus on tax credits and the living wage. The Economist worries that a higher minimum wage will impact jobs. I do too, but there’s only one way to find out, and that’s by gradually raising it. No doubt eventually employers will find it cheaper to automate than to hire more workers. But that’s the elephant in the room – that is going to happen anyway, as software and robots develop over the next decade. We need a policy response to the increasing numbers of people whose skills are too low to qualify them for work, and tax credits won’t be the answer. Cutting tax credits and welfare is seen as a political move – it’s popular with people of many income levels – but that’s because it’s a moral issue. Most people don’t believe that working should pay less than welfare, and they don’t think that part-time workers should have their wages topped up so that they earn more than full-time workers. It’s plain to see that we will have to go through some pain to unravel the tax credit system and return to the land of common sense. The newspaper also regularly bangs on about the decrease to welfare in the context of rises in pensions. But that simply reflects the reversal of the opposite policy under thirteen years of Labour government. Pensions are still lower than they were in the eighties. Anyone who thinks they are generous just needs to look at the numbers: the new state pension is £8K pa, the full-time minimum wage is £12K, and the ex-London benefits cap is still £20K. It’s easy to see that the generous allowance is going to the person who contributes / has contributed the least. For further discussion of these issues, see two more articles in the Economist – fix then fiddle and sad triumph – plus for the alternative perspective, try this Spectator leader on one-nation economics, or Merryn’s MoneyWeek blog on how tax credits impact UK productivity. 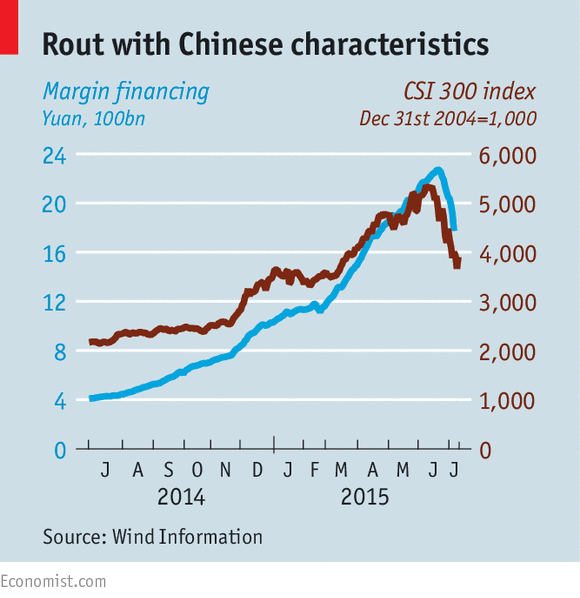 The Economist also looked at the Chinese government’s reaction to its stock market crash. Back in 2013 the Communist party decided to let market forces play a “decisive role” in allocating resources. Then this quarter shares fell by a third, or $3.5 trn – more than the total value of the Indian stock market. Trading in more than 90% of listings had been suspended by July 7th. There is little risk of a serious impact to the wider economy. Stocks have only fallen back to March levels, and are still up by 75% in a year. The stock market appears as disconnected from the economic fundamentals as it was on the way up. Chinese free float market capitalisation only amounts to a third of GDP, compared to more than 100% for other developed economies. Less than 15% of household assets are in the stock market. At its peak, margin financing reached 2.2 trn yuan ($355 bn) – about 12% of the free float or 3.5% of China’s GDP. But that was still only around 1.5% of banking system assets, so there will be no wider contagion. The newspaper was more concerned by the government’s understanding of the problem, and its reaction. Low returns from banks and restrictions on buying internationally make domestic stocks look relatively attractive in China. The bubble in the ChiNext market inflated because of a bottle-neck in listing new firms on the exchange. Instead, already listed firms acted as financiers, using overvalued shares (peak PE was 147) to buy firms waiting in the queue. 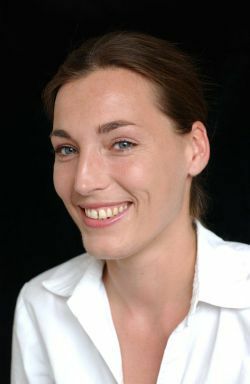 The Economist also looked at the potential for price comparison websites to lead to higher prices. Classical economics says that search costs undermine price competition. The harder it is to compare offerings, the higher prices should be. Insurance used to be a good example. Comparison sites have lowered the cost of polices offered by insurers, but if their own commission (hidden inside the quote) is larger than that saving, the price to the consumer will go up. If consumers stick to one comparison site, the commissions can be safely increased, since they apply to all insurers on the platform. The only way to ensure this doesn’t happen is to check all the comparison sites. In 2014 the competition regulator found that some sites banned retailers from offering cheaper prices to other platforms. The meant that other sites could not reduce their commissions (since the end price would not fall, and they would not gain market share). This also stabilised prices across platforms, reducing the incentive for consumers to compare across sites. This in turn encourages platforms to spend on marketing and acquiring customers, since the costs will be passed on to the retailer and the consumer. These contracts are now banned in the UK. Another way around the problem is to have a single, regulated comparison site, similar to the one the US government runs for health insurance under Obamacare. But this is not an easy task for governments – the US site had many problems at first. A site that compares the comparison sites sounds like a possibility, but it would be subject to the same pressures as a first order site. So people will have to shop around, just as they have learned to do with the supermarkets. There have been other charity scandals recently. Olive Cooke killed herself in May at the age of 92 because she was overwhelmed by requests from charities. I worked for eighteen months at a large medical charity, and I’ll never look at them in the same way again. We worked from a state of the art building in central London, and the fundraising and market departments might just have well have been selling shampoo. 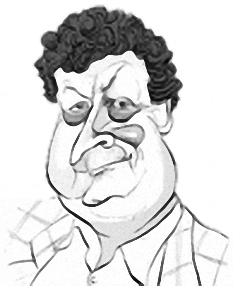 With perfect timing, Rory Sutherland over in the Spectator might just have a couple of better ways to give your money away. Kiva.org is a micro-lending site that lets you “Empower people around the world with a $25 loan.” You choose the people and businesses to lend to. They pay you back monthly, usually over a year, and you can then take your money back, or lend it to someone else. Pretty efficient in these times of low interest rates.